Inspired by the country’s iconic welcome flower garland, the Thailand Pavilion at Expo 2020 Dubai will refresh visitors while exploring the charm that empowers ‘Mobility for the Future,’ where innovation-based development combines with ‘Thai DNA’. The Kingdom of Thailand will showcase the transformation of its unique charm into the ‘smart’ country of Thailand 4.0 through the pavilion design and exhibitions, supporting how the country is moving toward being the regional hub of technology and digital innovations, combined with ‘Thai DNA’, thoughtfulness and smiles of the Thai people, to become the perfect combination of the Miracle of Smiles, witnessed in the Thailand Pavilion. With its unique geographical location in the heart of Asia, Thailand serves as a dynamic gateway to the fastest growing economic market in the world, whilst the country’s open-minded people, Thai hospitality, and fascinating culture, have empowered Thailand to connect with people across the world and attract all nationalities to visit Thailand at least once in a lifetime. At Expo 2020, the Thailand Pavilion will represent the country with the ‘Mobility for the Future’ theme, which supports the convenient Thai lifestyle and huge business opportunities that benefit from the innovation-based development and visionary planning of transportation, logistics, digital connectivity and personal mobility. Thailand Pavilion, inspired by the fresh flower garland, which is the symbol of what Thai people typically use as a token of warm welcome, luck, and respect, the Thailand Pavilion brings Thai flowers to blossom in the desert as the logo of the pavilion and the main component of the pavilion’s architectural design. Moreover, the flowers are also a good representation of endless mobility from its proliferation and dispersal of pollen. 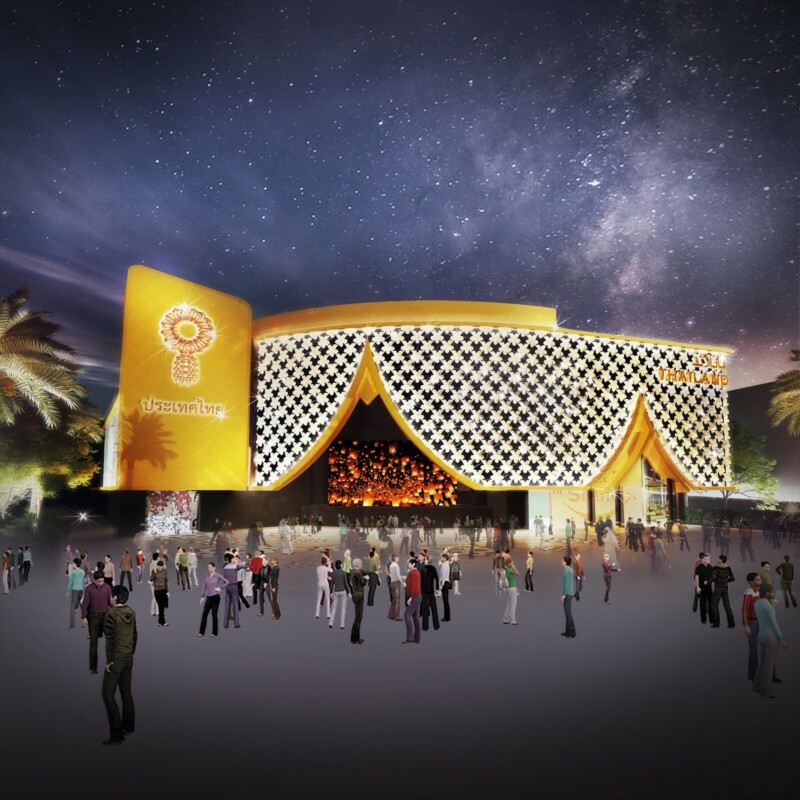 The garland logo is modified to represent the digital era, and the connecting lines are used to represent mobility and connectivity, whilst the Thailand Pavilion’s building will showcase a curtain of flowers, formed by weaving flowers together using traditional, hand-crafted wisdom. The pavilion design also brings out prominent features of Thai architecture such as the gabled hall, which embodies the Thai gesture of greeting (Wai). Moreover, the gable is also inspired by the garlands use of a native flower called the Dok Luck (Luck flower), typically used for love and luck in the local context, for covering the exterior building with woven flowers that look like a huge flower curtain surrounding the pavilion. The main colors used are gold to signify the flourishing golden land with endless prosperity. Located in the Mobility Thematic District, with a large plot size of 3,606 square meters, the Thailand Pavilion will emphasize the country’s capacity for being a hub of digital innovation and technology, and as the gateway to the region, facilitating trade and commerce where new opportunities, innovations, markets and cooperative projects can take place with ultimate convenience. The Digital Economy Promotion Agency is responsible for the Thailand Pavilion at World Expo 2020 Dubai, the operating arm of Thailand’s Ministry of Digital Economy and Society (MDES), and their official representative, Index Creative Village PCL., the Creative Business Leader in Thailand, with solid experience in managing turnkey projects such as Thailand’s pavilions at World Expos for over a decade. The pavilion is expecting to be another auspicious place where innovation-based development combines with ‘Thai DNA’, thus attracting visitors, investors, and business tycoons from all over the world to Thailand and connecting people globally with the hospitality, thoughtfulness and smiles of the Thai people, to become the perfect combination of the Miracle of Smiles, witnessed in the Thailand Pavilion. 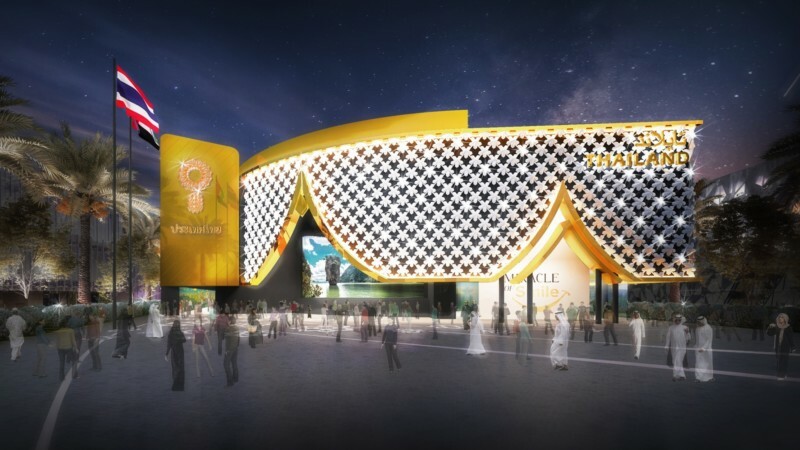 Thailand is the latest country to reveal the design and theme of its pavilion at Expo 2020 Dubai. More are expected to follow in the coming months.